The Lizard People might be getting support again on Tuesday. 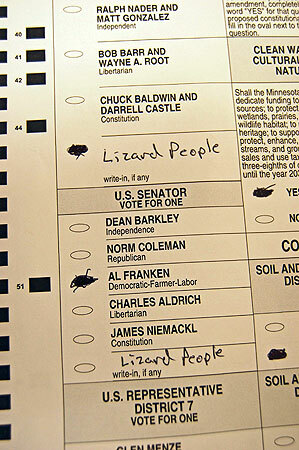 Lucas Davenport of Bemidji made “The Lizard People” a household word in Minnesota two years ago when he appeared to write in Lizard People on a ballot in the disputed Al Franken – Norm Coleman Senate race. What about Tuesday’s election? I asked Davenport if The Lizard People will be getting a vote. Davenport’s creation — inexplicably — even made a column in USA Today today about the science of math in numbers in which a mathematician argues that a coin flip is as fair a way to settle a close race as a recount of votes. I think I saw negative ads from Lizard People. Wait, that was just a regular candidate.